It’s a massive shame that my opening goal analysis for England’s World Cup “journey” is for a goal like this. And, in fairness, whilst we all know how the ball eventually ended up in the onion bag (*hates self*), the way in which the move unfolded was fairly typical of long periods of the game. 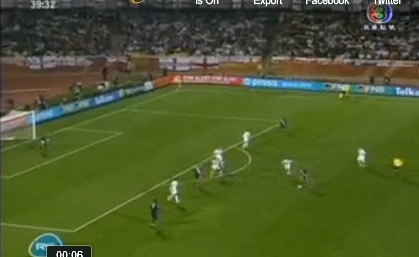 Clint Dempsey picks up the ball between England’s defence and midfield (he and Donovan had joy in this area, and England’s midfield lacked positional discipline without a dedicated holder). Gerrard drives back at Dempsey (as he did throughout the match) to hold him up, but Dempsey spins away. Gerrard has stayed tight until this point but, for me, there are still not nearly enough England players back in the picture. One more spin from Dempsey, and he’s shaken Gerrard off, making plenty of room for a shot – we know full well that he is a danger from distance, and with the new ball causing problems for goalkeepers in training, it’s not wise to give him opportunities like this. However, the shot is a tame one. He doesn’t catch it well, and it’s devoid of power. “They” always say you should aim to hit the target first and foremost, and that’s what Dempsey does. Green made a slight nod towards the new ball causing problms in his post-match interview, but I don’t think it had much to do with it; it bounced twice, didn’t move in the air, and would be the sort of shot that he’d expect to easily stop 999 times out of 1000. 4 – Rob Green made more errors leading to goals than any other player in the Premier League last season. Calamity. However, whilst it’s very easy to blame Green for our failure to get the three points from yesterday’s game, Capello made some real fundamental errors. 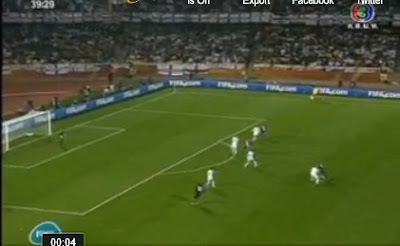 It’s long been said that 4-4-2 suits England, because most of the players play in this formation for their club. Of yesterday’s starting 11, only King, Lennon, and sometimes Milner and Heskey regularly play this formation. The rest of the team play a variation of the 4-3-3/4-5-1. In fact, Rooney, widely seen as our main man, has arguably played his best football over the last year, whilst leading the line in a 4-5-1. I noticed yesterday that Rooney was peripheral. We tended to play through Heskey, who did well in fits and starts, but also misdirected many flick-ons, surrendering possession cheaply (and that’s ignoring his missed chances). We’re told by the well-informed that Heskey is there solely to allow us to get the best out of Rooney, but with Rooney up front alone, and a dedicated holder in midfield (Barry or Carrick – whilst the latter isn’t flavour of the month, I find it hard to argue with Xabi Alonso’s comments here), we should get the best from our key players. Lampard and Gerrard get to play their more natural roles, Rooney gets to lead the line on his own (and see more of the ball), and we have the added bonus of a player that is comfortable with the ball at his feet, and will keep possession with sensible short passes. The other major issue yesterday was our defensive shape. Our back line was too deep from the start (especially given that the USA aren’t a particularly quick side), and the gap between the defence and midfield was ridiculous. A prime example of this came during Altidore’s second half break. He is played in, turns Carragher, and bears down on goal. He chooses (somewhat selfishly?) to take on the shot at the near post, bringing out a fairly routine save from Green. But had he looked up, he’d have seen two players – one on the penalty spot, and one just coming into the picture, totally un-tracked by our midfield. I’m sure that Barry will come straight into the side for the next game, and I personally hope that it’s at the expense of Heskey. I fear though, that he’ll come in for Milner, with Gerrard switching to the left. I’m still confident that England will come through the group stage, and I look towards Italy’s famous slow starts in previous World Cups for a positive to cling to. The saddest thing about yesterday’s game, though, was that the USA side was clearly greater than the sum of its parts; England were, and very often are, quite the opposite. Good work sir! Amusing and analytical. What more can one ask from an amusing analysis of a football match? So who should we play in goal on Friday? Personally, I would like to see Lennon standing on Wright-Phillips' shoulders, wearing a big oversize comedy overcoat. Should be more effective than Rob Green. Diving might be a problem though... Still, should be more effective than Rob Green. Well, I'd probably have opted for Hart from the start, but now that there's been such a foul-up, it would be harsh to throw him in at the deep-end. I'd be tempted to go with James. Is he a safe pair of hands? Probably not. Is he a big character? Absolutely. He will bark orders all day long, which is what another new back four will need. Seemed to me that on the right side Glen Johnson was happiest cutting in to the penalty box and Lennon speeding to the byline and crossing, when they did that we looked dangerous, however it seemed Capello wanted Johnson to over lap and Lennon to speed into the box much the same as the left wing, i noticed it at the end of the first half, beginning of the second they were back to doing it the way they didnt want again, so no doubt Capello gave them a few words at half time. Gerrard said we should 'get behind robert'. Yeah good idea, stand behind on the line. Useless wet spam cnut. You are correct about both Gerrard and Lampard, they are players who are best when driving forward and scoring, but not playing in defence in front of the back four. The manager should bring in Joe Cole on the left, and like you say bring in a D/M to play in front of the back four. 4-1-2-3. What was Glen Johnson starting position for that one you have shown above? He was not giving his centre back any cover, and he has a lot to learn about defending. A Cole had got back to cover their other player. 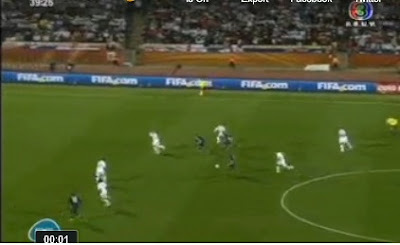 Changes must be made against Algeria, England didn't click second half. I agree, I predict we'll beat Algeria 3 or 4 nil and suddenly we'll be hailed as world beaters again. Of course, I would take a 3 or 4 nil win over Algeria!